Free download VideoPad Video Editor latest version. People remain in search of easy to use software for video editing. VideoPad is such software for beginners with very easy editing tools which make the video editing quite cool. 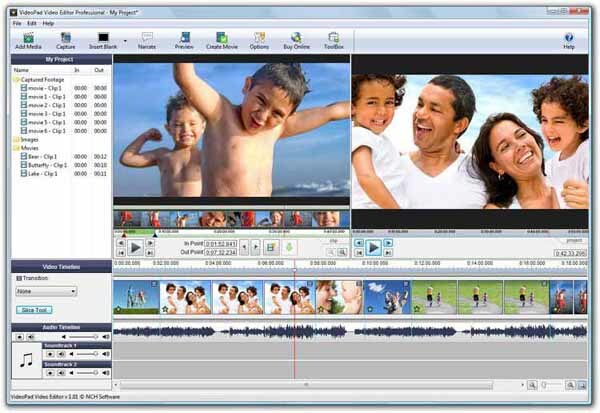 VideoPad Video Editor is developed by NCH Software for the home and professional use. VideoPad can be utilized more if used with other integrated software including WavePad, MixPad and PhotoPad. WavePad is a sound-editing program; MixPad, a sound-mixing program and PhotoPad, an image editor. The VideoPad Video Editor has a complete GU interface. There is a simple menu bar with editing options by which you can alter, reset, edit and save your work. There are also large icons for adding file, text and recording. The software is also capable of drag and drop file selection with double built-in screen which enables you to see both input and output. You can also use a few video effects and some transitions. Moreover still images such as blank background or an image can also be added. There are also two soundtracks where you can drag your audio file over the soundtrack line to add it. After editing and completing the work the file can be saved or exported to a variety of formats. This is available free for home use. If you want to use it professionally then you can purchase it. Video Formats: MPEG, AVI, ASF, MPG, 3GP, MP4, M4V, FLV, MKV,MPE, VOB, MOV,WMV.